Fire up the panini grill for this Chicken-Pesto Sandwich recipe. Our Chicken-Pesto Sandwich is perfect for lunch, and ready in just 15 minutes. 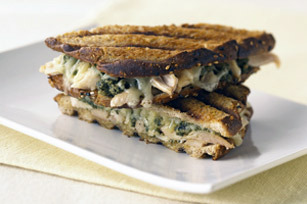 Combine chicken and pesto; spread onto 1 bread slice. Top with cheese and remaining bread slice. Grill 3 to 5 min. or until cheese is melted and sandwich is golden brown on both sides. Serve this warm sandwich with baked chips and fresh fruit to round out the meal. Heat large skillet on medium heat. Cook sandwich 2 to 4 min. on each side or until cheese is melted and sandwich is golden brown on both sides, gently pressing down top of sandwich with a spatula to flatten slightly as it cooks.